Boasting 295 rooms, the hotel offers free Wi-Fi, 24-hour room service, an outdoor pool, a spa and fitness centre, two restaurants and one bar. It is strategically located in the heart of Kuala Lumpur's commercial, shopping and entertainment hub. 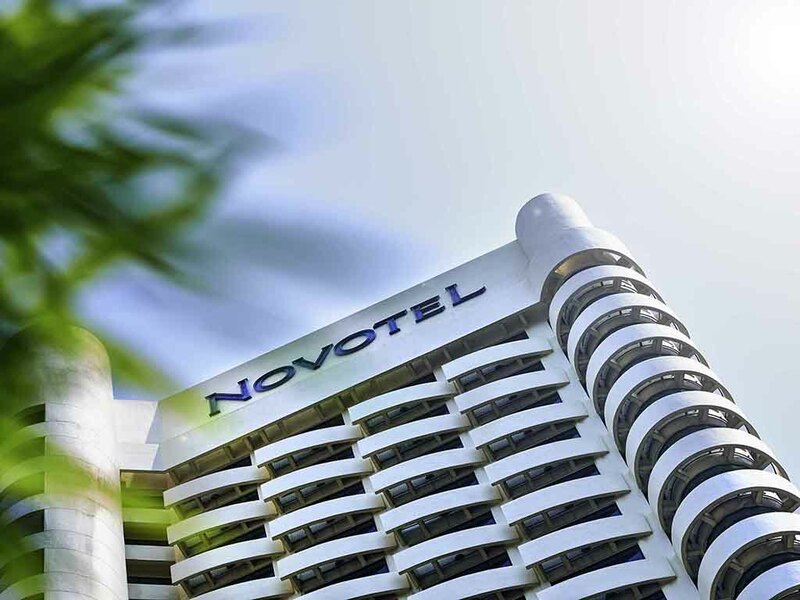 Novotel Kuala Lumpur is located in the city centre, less than 5 mins walk to Kuala Lumpur Convention Centre (KLCC) and Pavilion shopping centre, close to train station and entertainment hub, perfect for leisure or business. City-centre parking facilities. Fee for in-house guests is RM5 per day throughout stay. My children enjoyed with every single moments staying in Novotel. The sound proofing of the room is very bad, I can hear the noise of running water or flushing from next room. It made me unable to sleep properly at night. Furthermore, the remote control was spoilt and unable to switch channels and volume. The breakfast place was too warm and dark, air conditioner seems like not working well. Hope that the management will improve these. I had sent the following email in October 2018. I also communicated to the hotel over phone. There was no response . Last week during my stay at the hotel, I reminded the front desk Manager twice, showed her the letter. But it fell into deaf ears. I stayed in room 512 this time. The tub was slippery. Everyday I cleaned it myself. On Friday, July 12, I forgot to clean, turned shower on and stepped into the tub when I slipped and fell. It was a fall headlong, precarious. Thanks to God, there were no external injuries, though I am having severe back pain. Moreover the tub is more like a manger, tall and narrow. Have you not seen tubs in other star hotels? I think it is a way to improvise at the fatal cost of your customers. Hope the management would give a serious look. Letter I sent in October 2018: Dear Friends, I checked out from your hotel yesterday, 10th October 2018 at about 6:00 PM. On reaching home I realised, I left my Apple Phone charger in the room, near the writing table. My Room number was: 702. My request is to see if you can send it to me by a courier service. I shall pay for it on its arrival or charge it to my credit card provided while booking. Or advice how I can send the money needed for it. Here is my address: DR. JOAB L. 4-7-18/18, SRI SAI NAGAR NACHARAM HYDERABAD 500076 INDIA PHONE: +9… Thank you for your help. Sincerely JOAB L. NB. After this When I spoke over phone to the front desk manager, he said he had found it but I do not know why they did not take care to deliver. Staff was superb, definitely tried their best in terms of service. and location of course is great. However the product was bad, and with the price i paid for a &quot;corporate&quot; rate, there are plenty of choices in the area. Also, the hotel is just so dated but of course you are renovating. I couldn't rest well, because your piping made so much noice when the next rooms use the washroom, but the management won't fix it despite knowing the issue. I think the was the biggest dissapointment. Basics of accomodation is to have guests rest with lous noises!! The staff were exceptional regarding our safety and comfort. Hotel is getting a well needed upgrade. Food was great. The room condiments a little lacking as we needed to keep asking for face clothes, toilet paper and hair conditioner. Good and happy with stay! Checking in was easy and fast with friendly staff. The location is good with easy access to shopping malls. Room is clean but it would had been better if the lightning is brighter inside the room. The shower head in the toilet for Rm 1212 was not working well but still usable, hope the Head of housekeeping would take note and check all rooms for this problem. Overall am happy with my stays here plus all staff are friendly and helpful even the cleaning staff. Novotel KL has done an excellent job in making us feeling welcome and at home with the team of dedicated and friendly stuff. From the security personnel at door front to concierge to reception counter to dining hall to house keeping. You can feel the pride and efforts they put in to make Novotel a truly wonderful experience! Well done team! Stayed here for 1 night and everything was perfect. Staff were very friendly and welcoming, room was standard Novotel, and location is great for tourists being next to a large mall in Bukit Bintang and easy walking distance to Twin Towers. The staff really went the extra mile to make it a great stay, which is a reason I will return again. Great and i recommend it to my friends. M not satisfied with it. Yet the staff is very lovely , friendly and helpful. Hotel is not that good. The air conditioning is giving high sound all the nights. Hotel locates close to sky walk that I can walk to KLCC and Mall in Bukitbintung. I know you are doing renovations at this time, BUT... The room had a sickening smell probably from paint. I had actually thought of staying another couple days, but chose to leave after 2 nights. This is a not a Novotel hotel, but this is below ibis style hotel. This is the worst hotel of novotel property. Carpet very old, blanket is like 1 star hotel. Bath tub very slippery & risky, breakfast is not standard & staff not aware of food contents or vegetarian food, staff not trained properly. While making the booking we were immediately informed about the renovation work being done on the Premiere floors. The noises from the renovation work did not bother us. Hot water was not working when we arrived. This was rectified in about 15 mins. The problem returned the next day and mentioning it to the reception did not yield anything. Then the flush began malfunctioning. Again. the complaint did not get a response. The same staff have been very helpful during all our past stays - I think they felt a bit overwhelmed/helpless because I am sure that we were not the only ones with problems. One day the the AC developed a leak - was fixed. All in all a problematic stay. I have a pleasant stay in overall, but if possible please improve the water temperature, I found that it is not hot/warm enough. Not good. Not much vegetarian food in restaurant we had to eat French fries and Singapore noodles. Room is also badly maintained. Not satisfied. Being a member I don't wish to stay in this hotel again. I have been staying at your hotel for many years. The condition of the hotel appears to be getting worst, I understand that it is old and it is going through renewal at the moment, but it just feels old. rooms are very old and not bright enough. Service is nothing more than ordinary. i always make it a point to stay at an Accor hotel whereever i am, usually it's always Novotel first, i dont get the accor experience that i recieve in other Novotel that i have stayed at. As a gold member, I would have expected a nice upgrade but didn't get one, doesn't feel like efforts were made to prepare the room for me. To be honest, I would have gotten a much better experience at Sofitel. However, this hotel has the great advantage of an excellent location and a relatively low price. I hope things would improve fast. Renovation was not disclosed on the website and I requested for high floor and got it. Not knowing that renovation work is on the higher floors. Felt deceived. Had to leave the room because the noise was horrendous. Hot water did not function for 2 mornings till 10am. Only 1 International News Channel (Al Jazeera)for a International Chain Hotel! It seems clear that Novotel management has little say over this. Bad experience and did not live to the Accor brand of hotels. King size bed is 2 twin beds joined together!